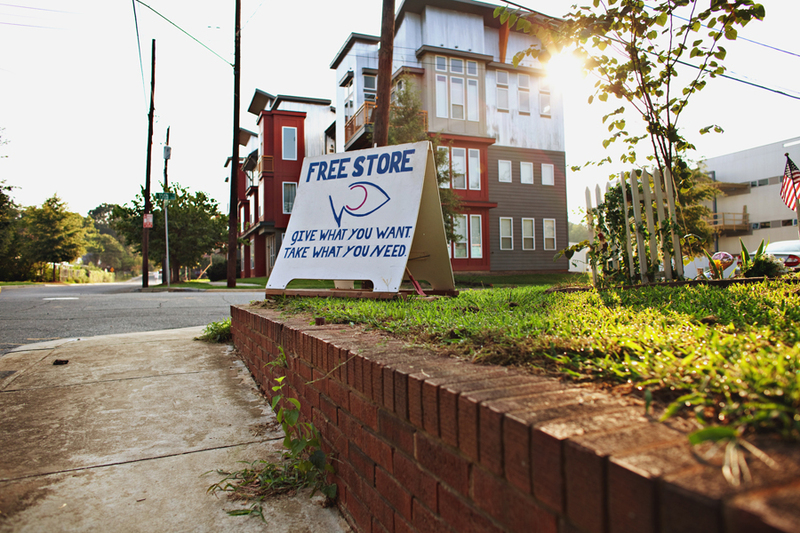 "Give what you want, take what you need" is what the sign outside of Charlotte's Free Store reads. I recently found myself standing in front of the same colorful walls that have inspired me so many times before, but with totally new and different insights. At the corner of Davidson and 15th St begins a block known to some as Optimist Park. If you frequent Davidson St then you might know this corner as the one with all the happily painted walls depicting the home of the bicycle recyclery. Just beyond the recyclery's fence lies a small business incubator called Area 15. The walls of this 23,000 square foot building are bursting with inspiration from evolving artists and entrepreneurs -- literally -- it is a challenge to find exterior walls that haven't been turned into an expression of a tenants' art. Some of those tenants are musicians, designers, writers…and just plain enthusiasts. Area 15 hosts a 24/7 Urban Prayer Room where spiritually hungry pedestrians are invited to begin a friendship with God and engage with fellow-Christians in the war for social justice. A little further down 15th street is the cornerstone of Area 15. An old house that has been clothed in teal paint and trimmed with orange and white accents. The sign out front simply says Free Store. Optimist Park is a concrete jungle covered in color and creativity. Its' walls promote hope and love. It is truly an artists' haven…particularly this artist. Myself, and many other local photographers have stood in front of these inspirational walls creating memories for engaged couples and happy families. But a few weeks ago I was on an assignment to go inside of these walls. And what I found was more than a word or two can describe. I was recently introduced to Matt and Lana Shaw, the incredible couple behind Speak Up magazine. Haven't heard of it? That's because the first edition is about to published next month! Speak Up will be distributed exclusively by homeless vendors -- providing them with a job and a purpose. The mission behind the magazine is to "educate the public about homelessness, disparity and ways to help." Speak Up is entirely non-profit and the recipe for making the magazine looks something like this: blood, sweat, and tears and then repeat until you can't anymore. Lending my photography services to this cause was not even a question. This new found partnership is what brought me to The Free Store to document all the love that is being shared on one little corner. Want to know more about it? Head downtown next month to buy a copy of Speak Up! My adventures with Speak Up have also recently taken me to a pitch black alley behind a closed grocery store to meet a fearless dumpster-diving college student who has small pockets but a huge heart for feeding the homeless. The story will be in the magazine! Speak Up has the power to change the streets of Charlotte. The lives of homeless people will be redeemed as they obtain job skills and learn to sell magazines on the streets that currently represent hopelessness to them. My prayer is that those streets will one day come to symbolize confidence and ambition. You may remember that I had the opportunity to teach photography to homeless kids this summer with the help of Silent Images and a Child's Place. I couldn't help but think of those kids as I made connections with Speak Up. Maybe selling magazines in Uptown Charlotte is the way out for some of these families...and that, to me, makes it all worth it. Here are a few images from the final days of photography class. Most of these were taken while on our field trip to NODA where the students practiced their new skills. Speak Up has printed the very first issue of the magazine (woohoo!) but their goal is to print 9,999 more copies for the initial print run. The printing costs and overhead total to $8,000. They are half way there. They need to raise $4,000 by August 31st. If you have a desire to make this thing happen head over to the Speak Up website and donate whatever you can! If you made it this far...thanks for sticking with me. More Speak Up adventures to come...no doubt.